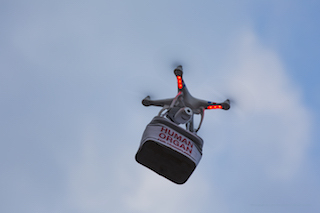 Drone delivery is helping transport blood to rural parts of Rwanda – and the company behind it hopes that even with strict drone regulations in the US, it’ll be flying American skies by late 2018. In 2016, robotics company Zipline created the world’s first commercial drone delivery service, using drones to transport blood to rural areas of Rwanda. The company owes its success to a recent surge in drone technology and, as of August 2017, had completed 1,400 commercial flights and delivered 2,600 units of blood. Now, Zipline plans to operate its services in Tanzania as well. And it’s hoping to be able to test a similar service in the US in the near future. Zipline’s drones drop the blood to hospitals in Rwanda by parachute, alerting doctors by mobile phone when the packages are about to arrive. Delivery costs range from $15 and $45 per item depending on weight, urgency and distance. The project currently serves 12 hospitals and has cut the time it takes to procure blood from four hours to 15 minutes. It’s no secret that the Silicon Valley-based startup hopes to operate in the US. In an interview with Recode in March 2017, Zipline CEO, Keller Rinaudo, said he hopes the US government is “looking at what’s happening in Rwanda and is excited.” However, operations would still struggle to circumvent the US’ strict drone laws, despite the Federal Aviation Administration (FAA) creating new, more liberal regulations around the use of drones by commercial operators. Zipline is in the process of applying for a waiver from the FAA, and is hoping to be operational in American skies by late 2018. For Rinaudo, the fact that Zipline has been successful in Rwanda is proof that it could help millions in the US, particularly in rural areas. By continuing to prove its efficacy around the world, Zipline’s project could prove pivotal in changing drone regulations more so, as well as helping serve isolated communities, expanding its project to delivering medical products including emergency vaccines, HIV medications, and anti-malaria drugs.